Lining the pan with plastic wrap makes it easy to remove the firm gelatin and cut it into shapes. Scraps can be cut into bite-size pieces and layered in a bowl with whipped cream. Line a 9 by 13 inch baking pan with plastic wrap, making sure to leave extra plastic at the ends to use as handles. Add 6 cups boiling water and whisk until completely dissolved. Let cool about 10 minutes, then pour into lined pan and chill until completely set. 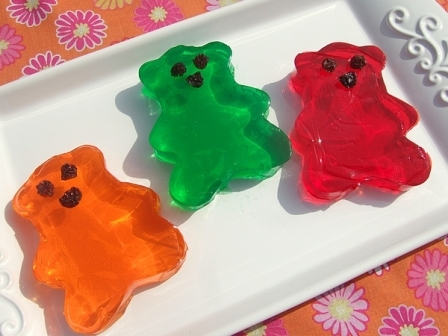 Remove gelatin from pan and cut with your favorite Ann Clark cookie cutter. Decorate with fruit, nut, and whipped cream if desired and serve.